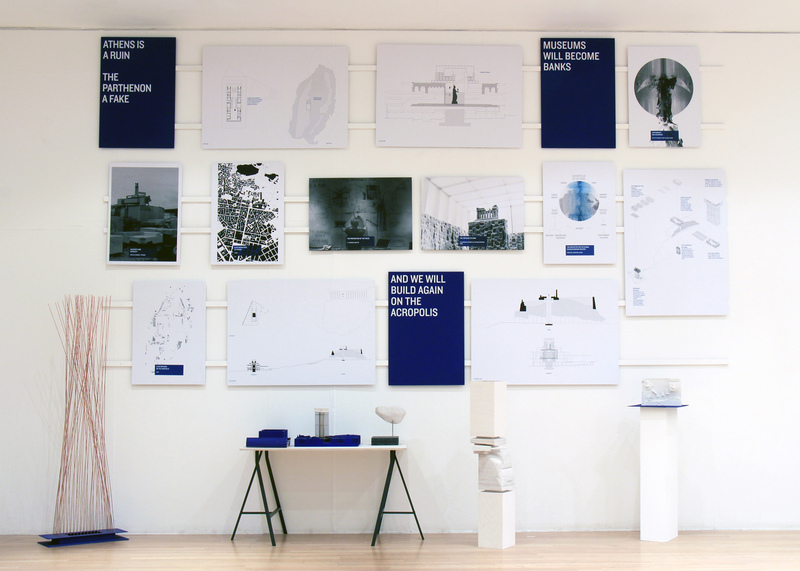 Graduate shows 2016: architecture graduate Kit Stiby Harris has proposed relocating the "fake" Parthenon from Athens to the British Museum in London. This would allow the 2,500-year-old structure to be reunited with the Elgin Marbles – decorative stone sculptures from the Parthenon's facade that are controversially kept at the London museum – while raising money to fund projects in cash-strapped Athens. The provocative graduation project, titled Athens is a Ruin, The Parthenon a Fake, went on display at the Royal College of Art in London this week as part of Show RCA 2016. It proposes a long-term loan of the famous building in return for a substantial fee. "Following a field trip we conducted two years ago, we realised that austerity has made Athens – previously a city based around the world's most famous ruins – a ruin itself," said Stiby Harris, a graduate from the RCA's school of architecture. "The city that has come to symbolise the cradle of western civilisation also now represents the failures of Europe," he said, referring to the economic crisis that has crippled Greece. "Why don't the Greek government lend their half of the marble sculptures, along with the demountable Parthenon, to the British Museum for a considerable sum of money over a period of 20 years?" he told Dezeen. "The funding from that long-term loan goes back to Athens, which is where the meat of the project lies." Stiby Harris said the Parthenon could easily be taken apart and shipped abroad, since recent work on the structure had turned it into "a high-tech building in the heart of Athens." "While Athens languishes, the ancient monuments on the Acropolis have been the subject of a €200 million (£160 million) restoration programme," Stiby Harris wrote in his project text. "Stones deemed too ruinous have been replaced with freshly carved, gleaming pieces of Pentelic marble, perfectly fitted using 3D scanning. Titanium armatures hold these newly carved blocks in place so that the whole temple is now corrosion and earthquake-proof, and all alterations to the fabric may be easily reversed if necessary." He added: "The Parthenon is becoming a high-tech building, a copy of itself, while the only development in Athens is the tending of ruins." This year marks the 200th anniversary of the sale of the Elgin Marbles – which were taken from the Parthenon by Scottish aristocrat the Earl of Elgin between 1800 and 1803 – to the British Museum. The Greeks have long agitated for their return, but the British Museum has consistently refused. Stiby Harris instead proposes that the building and its carved frieze be reunited in London, where it would be placed atop a temporary 112-metre-high structure to match its elevation atop the Acropolis hill in Athens. Money raised by the venture would fund a new type of bank in Athens, which would store original artefacts from the ancient world along with specially made copies, reflecting that fact that the Parthenon – which at one time served as a bank – owes much of its fame to the fact that it has been so widely copied around the world. "Athens is currently a test-bed for experiments in finding alternatives to capitalism," Stiby Harris wrote. "These experiments, however, need urgent funding. In light of this, the project proposes the construction of a new bank, based on a new type of financial model derived from the success of the Parthenon." Artefacts and their replicas would be stored in chambers carved out of the Acropolis beneath the original location of the Parthenon. "Given that the Parthenon itself was at one time a bank, this project asks how reinstating the Parthenon as a bank might affect the problematic relationship between Greece and its past," writes Stiby Harris. "This project's aim is not to solve the Greek crisis, but instead to provoke an international debate which questions cultural capital, debt, value and myths." The Parthenon, located on the Acropolis overlooking Athens, was built between 447 and 438 BC as a temple to the goddess Athena. It is regarded as one of the world's most important cultural monuments and the high-point of the Doric style of classical architecture, while the Elgin Marbles are considered masterpieces of ancient Greek art. Dezeen has teamed up with the Royal College of Art as media partner for its graduate exhibition, ShowRCA, which runs from 26 June to 3 July. Other highlights include a toaster that sneezes out bread crumbs and a vacuum cleaner that poos, as well as a search engine based on the methods of Classical Greek philosopher Socrates.